Jared sells subpar quality diamonds – often with unreliable certification. To add insult to injury, their prices are also very high. You will get far more value for your money buying online from Blue Nile or James Allen. Jared, The Galleria of Jewelry, is one of the flagship jewelry chain brands owned by the Signet corporation. They are Signet’s attempt at offering a more personal experience than their mall store chains like Kay Jewelers and Zales. You usually find them in shopping mall areas as a standalone store. There are roughly 250 Jared locations in 39 states. Jared stores bring in $1.2 billion dollars in revenue for Signet, making up about 1/5th of their total sales. Jared locations differ from their sister stores (Kay and Zales) in a few ways. Firstly, their staff is slightly better trained and have a little more knowledge of the products. Secondly, they do offer marginally better quality (though we’ll delve into their “quality” later on in this review). Lastly, each location has an in house jeweler that can do minor repairs and modifications. I guess this gives them a leg up against their sister brands as they don’t have to be plagued with the same accusations of diamond swapping that has cropped up in the press recently. Here we will explore Jared’s business model in depth to figure out why their prices and quality are not competitive and how they try to make up for that. We will explore the costs the company has and how that factors into their products and pricing. This is, by far, the biggest cost for any store. A typical Jared Galleria sells roughly $4.8 million dollars of jewelry a year. The rule of thumb in retail is that a good store turns over their inventory around 2.5 times a year. Most stores likely average about $2 million dollars of inventory on hand at any given time. Multiply that by 250 Jared locations, and that’s $500 million dollars of diamond inventory the Signet Corporation must carry just for their Jared stores. The company has two ways of supplying their stores; buying diamonds using credit or taking the diamonds on consignment (the diamond manufacturers “lend” them the diamonds and Jared only needs to pay when the diamond is sold). Either of these choices adds significant cost to the actual product. Either they are paying bank interest on their inventory or they are borrowing products from the manufacturer. That manufacturer needs to make more money on the product if they have to float Jared a loan at the same time, so the cost basis for the product goes up. This is in stark contrast to the business model of Jared’s stiffest competition: online retailers. Online retailers don’t need to have millions of dollars sitting in one store waiting for people to walk in. In fact, online retailers don’t need to own any inventory at all. As we explain in our Online Vs. Brick and Mortar article, online retailers list diamonds on their site directly from the major diamond manufacturers. They only purchase the diamond when the customer buys the diamond. The better online retailers like James Allen and Blue Nile have contracts set up so that every diamond listed on their site is guaranteed to be available. This saves online retailers significant amount of money and is one reason they are able to offer better products for lower prices (more to follow). Two other major cost that weighs down a large company like Jared are employee costs and property costs. Let’s start with employee costs. Unfortunately we can’t get specific breakdowns of Jared’s employees, so we’ll use the overall costs for the company to get a ballpark figure. Signet has roughly 30,000 employees. Overall, they generate $6.5 billion dollars in sales. That means that for every employee that Signet pays a salary to, about $216,000 in sales are generated. Blue Nile has 300 employees that generate $475 million dollars in sales. That means each employee accounts for $1,578,000. This puts Jared at a severe disadvantage on two fronts; first their overhead costs are significantly higher and must be factored into the cost of the diamonds. Second, Blue Nile has the luxury of investing more in their employees. This results in more knowledgeable and experienced sales staff and better craftsmanship and quality in the product. Property costs are another large cost that gets factored into the cost of a diamond. As said before, the average store location sells $4.8 million dollars in product. Remember, Jared locations are not small mall stalls, they are large free-standing buildings in prime retail areas. Blue Nile, to the best of my knowledge, has four locations around the world. That means that each location accounts for north of $100 million dollars in sales. And those four locations are not retail locations (which carry much higher costs), but are warehouses and office space. Named after a famous diamond cutter who developed the modern day dimensions for an ideal cut diamond, this is a traditional round diamond supposedly cut to the strictest of proportions. If you’ve wandered around our site a bit, you will see that we agree with the theory that the optimum cut for brilliance is a traditional 57 cut round diamond (we are not fans of gimmick specialty cuts). We talk about this at length in various articles. Unfortunately the rhetoric doesn’t match the reality. Most diamond companies that focus on perfectly cut round diamonds offer stones with AGS certification. AGS certificates come with an amazing light performance graph that is considered to be head and shoulders above the competition. At the very least the diamond would have a GIA certificate (the gold standard for diamonds in general). Instead, Jared chose to go with the substandard GSI certificate (we analyze that laboratory here). There is nothing about these diamonds to justify paying a hefty premium. To be fair, the cut was nice, but the diamond was nothing spectacular with very noticeable inclusions. It’s easy for a consumer to look at them side by side with the terrible alternatives they have in the store and think that they are brilliant. But if they had a chance to compare one to a truly real nice diamond side by side, they’d be seeing a much different picture. The diamond I was shown had a GSI certificate that claimed it was 1.04ct H SI2 and was priced at $7,490 including tax. The diamond was an I, I1 at best (very noticeable inclusions) and most likely a J color. Compare that to this far superior diamond from Blue Nile: a 1.01ct I VS2 GIA excellent cut for $4,785 . The cut is superb, and it is far better quality (True I color VS2 clarity). Yet Jared feels the need to charge you a 65% premium for their inferior diamond. Please don’t take our comparisons here as recommendations for what you should buy (though that is a great looking diamond). We are just trying to find similar diamonds so we compare apples to apples. If you are looking for help buying an engagement, contact us and we will make personal recommendations for you. This was another brand pushed hard by the saleswoman. One surprising twist with this brand was that they actually had respectable certificates for the diamonds. This was a first for me, seeing GIA certified diamonds in a Jared store (or any Signet store for that matter). That means the quality claims they made were accurate. Unfortunately, the quality of the Chosen by Jared stone was not up to snuff. The diamond was a 1.06ct F SI1 Very Good cut diamond for $8,988 including tax. That all sounds great, but it’s not what it seems. Very Good sounds like a fine grade, especially since it is the second highest of the five cut grades. Unfortunately, if you search on the internet and look at all GIA certified round diamonds available, you will find that more than half of diamonds receive an excellent cut grade and more than 90% get an Excellent or Very Good grade. Now let’s do a comparison to see the value. Here is a well cut 1.00 F VS2 excellent cut for $6,491. This diamond is far superior in cut, better in clarity and still comes in 30% cheaper than the diamond from Jared. The quality that Jared offers is subpar. 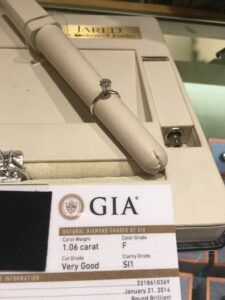 Either they are offering diamonds with weak certificates that are actually lower in quality than they claim, or they are offering poorly cut diamonds with GIA certificates (or both). And for these subpar diamonds, you are still paying a 50% premium. This premium pays for things like interest payments on their inventory, overhead costs for their locations and an inflated workforce; nothing that actually adds any value to the ring on your finger. I can’t see any justification for wasting so much money on a ring sold at Jared. The service is marginally better than your typical mall store (that’s not saying much) but you are still getting a subpar product for an inflated price. The service and quality from a website like Blue Nile or James Allen is far superior and you will save at least 30% at the same time. Several jewelers, including Jared, offer seemingly great gifts for holidays like Mother’s Day. Their advertisements often target a particular line of jewelry or even a specific item. While these may seem like excellent gift ideas for mom, the jewelry is often poorly made and of low quality. Instead of going with a sub par jeweler, choose a reputable vendor with high-quality diamonds and settings, like Blue Nile or James Allen. For stunning jewelry options for Mother’s Day, check out our Mother’s Day gift ideas.